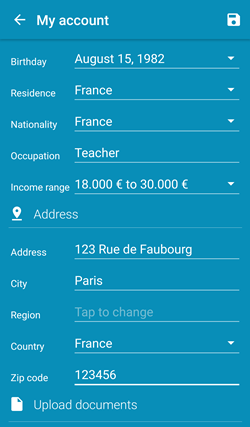 In the mobile main menu, choose My account in order to change the information related to your Moneymailme account. In order to change the current status, press on the status that is displayed under your profile picture. You can select your status from a list of predefined texts, or you can write your own. You can also change your profile picture from this menu. In order to do so, press on the profile picture; this will open a menu with two options: Take photo and Select from gallery. Select your option and update your profile picture accordingly. When a Moneymailme account is created for the first time, the type of the account is Light, which means that without providing documents to prove your identity, you have a limit of transactions executed within the application: in a legal year, you can execute maximum 2500EUR cash in (deposits or transfers from other users) and maximum 1000EUR cash out (withdrawals or transfers to other users). However, not filling details about your occupation, income range and address (postal address, country, city, region, postal code) means you can never withdraw money from your wallet. Press on the pen-like icon in order to update your account with personal information about yourself. Note that you cannot change the email associated to you Moneymailme account from this screen. In order to change your email, see section Change email address. After editing your account details, press on the upper right save-like icon. Having the account details filled in means you have a Light account with possibility to withdraw money from your wallet. In order to have the limits raise approved, a proof of identity must be uploaded. Note that if you change your personal information, a new proof of identity must be uploaded. After document is approved, you will have a Regular account, which means you have unlimited cash-in and cash-out per year. Press on the Upload document button on the bottom of your screen in My account menu. 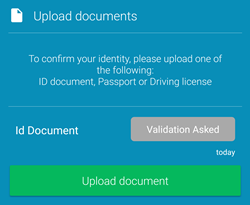 You will be asked to choose the type of document that you want to upload: ID document, Passport, Driving License. Choose the document type then choose to Take photo or to Choose from gallery an image of your document. After upload, press on Submit for verification. The status of your document will be Validation Asked. Usually, documents are approved in maximum 48 working hours. After validation process, the status of your document will become either Approved, or Refused. In case a document is rejected, a rejection reason is always provided. The list of documents is never cleared; all documents that you have exchanged will remain in the list for future reference. 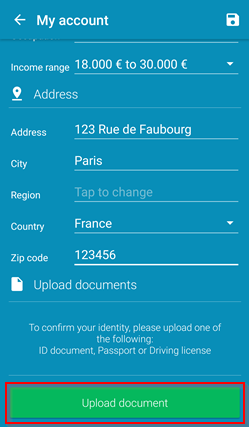 You will be able to see: what type of document you have uploaded, its status, and the date when it was uploaded. Note: If your transactions are suspicious (as detected by AML), you might be required to do some additional steps, like providing an additional proof of your address.